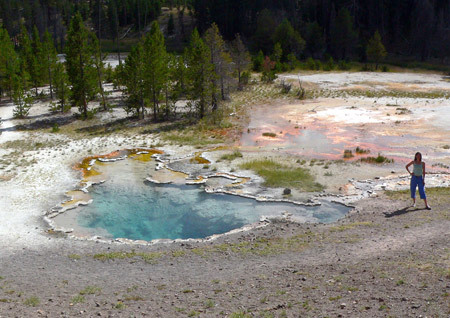 Researchers at Yellowstone Park have discovered a new bacterium that is capable of photosynthesis. The new species, Candidatus chloracidobacterium (Cab for short) thermophillum, was found lurking in microbial mats around three of the park's famous hot springs: Mushroom Spring, Octopus Spring, and Green Finger Pool - not far from the Old Faithful Geyser. Colourful microbial mats in Octopus Spring in Yellowstone National Park. Penn State University's Don Bryant, co-author of a paper* detailing the discovery, said finding the bacterium was "the discovery of a lifetime". "I wouldn't have been as excited if I had reached into that mat and pulled out a gold nugget the size of my fist," he said. Photosynthesising bacteria, those which can transform light into life-sustaining chemical energy, are extremely abundant, and account for half the photosynthesis on the planet. But Cab thermophillum is the only known member of the misleadingly-named acidobacteria phylum** that is capable of producing chlorophyll. Uniquely, it has special light-harvesting antennae called chlorosomes. Each of these contains around a quarter of a million chlorophylls. It grows near the surface of the mats, alongside cyanobacteria, or blue-green algae, where there is plenty of light and oxygen. Thanks to the hot springs, the temperature in this part of the mats is somewhere between 50°C and 66°C, and despite the acidobacteria tag it is an alkaline environment with a pH of around 8.5. The microbial mats in Yellowstone are particularly interesting to researchers because they are known to house a huge array of micro-organisms. But growing cultures of samples in the lab has proven difficult, and in many cases,impossible. The research team used a new technique, called Metagenomics, to find out more about the bacteria they cannot grow in the lab. DNA is sequenced from samples and researchers analyse the sequences for clues about the types of organisms and genes that are present in the environment. This, Bryant explains, gives the team a window into the physiology, metabolism, and ecology of organisms they would otherwise be unable to study. *The paper is published in the July 27, 2007, issue of Science , led by Don Bryant of Penn State University and David M Ward of Montana State University.